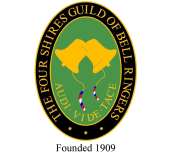 SS Peter & Paul, Blockley is very dear to the Guild, because the Old Minute Book records the very first Guild ringing meeting took place here on 28th April 1910. While Sherbourne was originally booked for the Saturday practice on 28th April (2012), it was thought worthwhile to substitute Blockley because of this noteworthy anniversary (please note the changeover). Come to Blockley exactly 102 years after that first historic meeting! SS Peter & Paul's Church has Saxon origins, as a monastic church was established by the Bishop of Worcester in about 855 (Blockley was in Worcestershire until the boundary changes of 1931). By 1131 later Bishops had a Palace there, and this importance prompted rebuildings of the earlier church. Evidence of the Norman church exists inside the Chancel, and outside, where there is superb tracery work in the eaves. Although greatly important religiously, the prosperous wool period never rewarded Blockley in the way it rewarded Campden, whose church benefited richly. Storm damage to the Norman tower in 1703 prompted the Bishop to order it be replaced. In 1725 the Vestry contracted with Thomas Woodward, stonemason of Campden, to dismantle it and build a new one. The present tower was completed by 1727. It is a well-built and very noble structure, and is certainly one of the finer towers in the area. The lower level of the old Norman structure was retained and can be seen inside. The church is fairly large and lofty, and contains a number of interesting features. There are many fine memorials to past owners of Northwick Park. A number of pews are new, and, in light oak, add brightness to the interior. 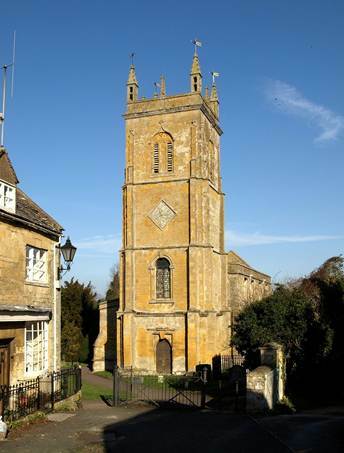 It has one very unusual feature: there is no internal access from the church to the tower! The church's guide book is an excellent production and is well worth a read. The bells (8, 16cwt) and fittings remain largely as they were when the Guild first visited. Some of these fittings are coming to the end of the lives, and the bellframe (an unusual arrangement using two separate units: a steel girder one by Bond of Burford on which the bells hang; and the other, the sills of a much earlier wooden structure, is used to mount the pulleys and sliders) ought to be replaced, too. This work is expected to cost in the order of £70,000 and will be required in about 3-4 years time. Anne Bourne will be pleased to hear from anyone that can help financially with this when the time comes. In the meantime, the bells are being used sparingly.